With a Bradley Refrigeration solution, you’re supported every step of the way. 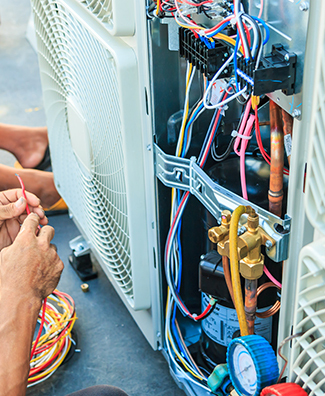 After installation, you can count on regular and cost-effective maintenance that meets manufacturer standards and doesn’t void your warranties. And if you need a repair, our highly trained engineers are on call 24-hours a day – anywhere in the UK. Based in Sheffield, we offer a nationwide service that’s thorough, timely and effective. With our refrigeration and A/C systems, you never have to worry about unexpected surprises. We don’t believe in hidden costs. That’s why full repair and maintenance coverage can be priced and included in your turnkey solution. It’s yet another way we make sure your cooling or A/C solution meets all your needs. Our engineers are fully trained and certified, and our repair and maintenance work meets manufacturer standards. So you never need to worry about voiding your machinery or parts warranties or extended warranties. Our scheduled maintenance plans increase efficiency and reduce your running costs. All of our repair and maintenance work meets F gas regulations and ozone depletion guidelines. So you can save money and do your bit for the environment. We understand that mishaps can occur any time, day or night. That’s why we operate a 24-hour call-out service, 365 days a year. We’re happy to respond outside of office hours, because providing the assistance you need is our top priority. At Bradley Refrigeration, the standard of our follow-up care is just as important to us as the quality of our systems. Book a routine inspection to ensure your system meets industry standards and is at peak performance. Need a quick, expert fix? We go out of our way to make first-visit and priority repairs happen.